Run as fast as you can and rustle up this wicked gingerbread man. With buttons for eyes and stitches that keeping him from falling apart, this devilish cookie will capture your heart. 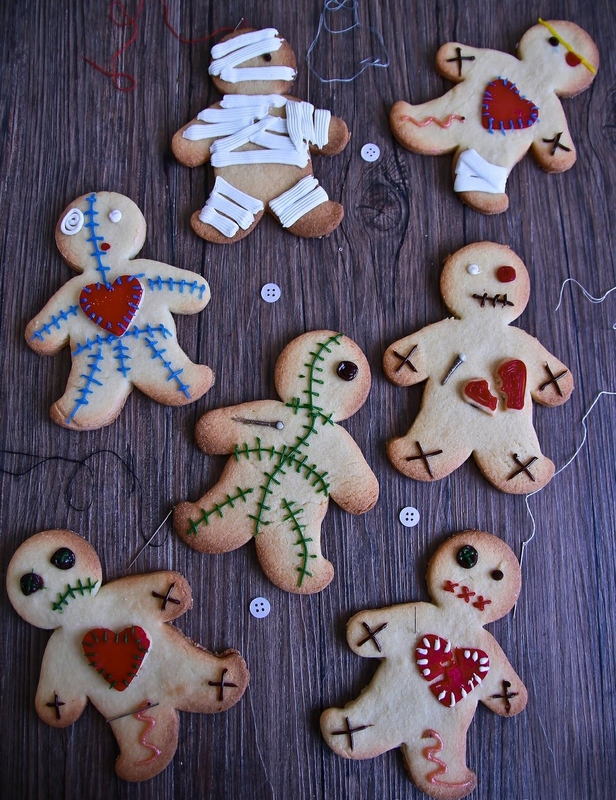 Now that you’ve gathered your pins and needles, it’s time to give your voodoo doll life. In a large mixing bowl, stir together the butter and the sugar until its smooth. Next, beat in the eggs and the vanilla. Then stir in the flour and cover and chill the dough for at least an hour. Preheat your oven to 400°. Roll your dough out on a heavily floured surface. Make sure that your dough is at least 1/3 inch thick. Dip your gingerbread man cutter in flour for easy-peasy cutting. Place your cookies an inch apart on parchment paper. Bake for 10 to 12 minutes. After your cookies cool, you can cut hearts out of red fondant. Create broken hearts by cutting zigzag lines down their middle. Give some of your voodoo dolls stitches for eyes or swirl black frosting to make button eyes instead. Use a toothpick to create the buttons “X” pattern. Jazz up your cookies by stabbing them with pins and adding slinking snakes. A treat worth dying for, let your guests sink their fangs into these gory voodoo cookies this Halloween. Instead of eating brains, Cherese Cobb uses hers to write. She has spellbound audiences at The Krazy Coupon Lady, Lumoid, the Penny Hoarder, and Take Lessons. This word-witch's poems have been published in Frogpond, Shemom, A Hundred Gourds, The Mainichi, and the Asahi Shimbun. She haunts Knoxville, Tennessee, where she lives with her undead parents and cat.